Anyone seen this? I just downloaded the latest version of RMS, updated an older system with the new files, now I get this when I try to connect to RMS from the controller. Well, the error has to do with the RMS module trying to send data on an object in the database that is not registered (for whatever reason) I think you may be running too new a version of RMS. I don't remember the cutoff version but I think it was 4.3.6 or .7 for older non-NX systems. You should probably give Tech Support a call and verify. Derrick, I would suggest calling into support on this one. There are some workarounds needed when upgrading an existing site to this version. Called AMX, got hooked back up. Solution was to FTP into controller and delete the RMS folder, let it rebuild folder contents on reboot. 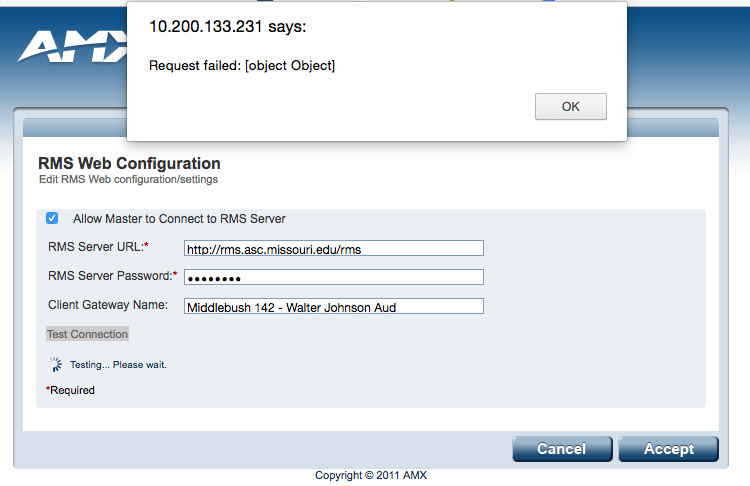 Now, back to my regularly scheduled head-scratching on RMS integration.